Features: 1.Elegant unique designed Fantastic hair bows for Hair Bag Shoes Clothing or other special occasion; 2.They have high quality lined hair clips, Easy and comfortable to use; 3.You will get many different color hair bows suitable for every occasion and any season; 4.They can fit well for babies, toddlers, girls even women, they are all 100% handmade baby hair bows for girls, A wonderful gift for yourself, friends or family. 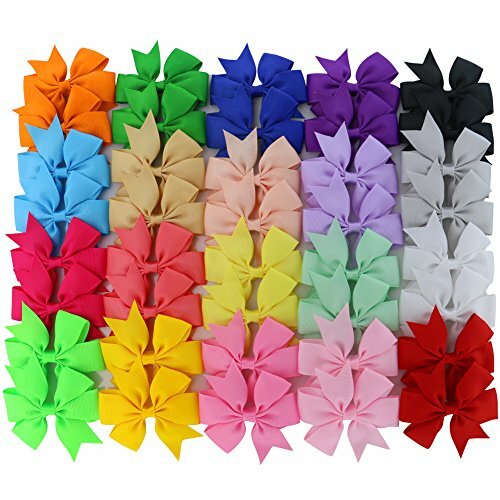 Specification: Material: these hair bows are made of high quality grosgrain ribbon, these hair bows are environmental, and harmless to anyone; Color: 20 different colors, they are all very lovely and bright; Size:3 inches; Condition: 100%Brand New. Package Included: 40 x baby hair bows Note: 1.Please allow a little size error due to manual measurement; 2.Please be reminded that due to lighting effects and monitor's brightness/contrast settings etc, the color tone of the website's photo and the actual item could be slightly different; 3.Chiffon is a protected Trademark; 4.Introduces the ultra soft material, no harm and no stimulation to baby's skin; 5.The new design would make your baby cute and charming, let your baby appear beautiful and stand out anytime. The pinwheel bows are attached to a professional card to make it a perfect gift giving.This item can wear alone and also look adorable on top of ponytails. Please use a pony o to tight her hair first and then slide this bow for decoration. This headband bows the perfect gift for any occasion! Birthdays, Baby Shower, Baby Gifts, Christmas and more. If you have any questions about this product by Myamy, contact us by completing and submitting the form below. If you are looking for a specif part number, please include it with your message.